COLUMNA MESSIANIC RESEARCH CENTER: Advanced Technology & Backward Morality 3: WHAT DO YOU THINK HAPPENED IF ADAM EAT FIRST FROM THE TREE OF LIFE? Advanced Technology & Backward Morality 3: WHAT DO YOU THINK HAPPENED IF ADAM EAT FIRST FROM THE TREE OF LIFE? If Adam obey first this 1st positive commandment, then he will be totally and completely at one with God, and God will be at one with Adam; both knowing Good and Evil in the Godly way (Genesis 3:22). This means that the Evil Forces will be under the control and dominion of Adam, instead of Adam submitting to Evil! WHAT HAPPENED IF ADAM ATE FIRST FROM THE TREE OF LIFE? If Adam ate first from the Tree of Life, then man would have known God the Father first and in the process be able to develop a very close and intimate relationship with Him at that early stage of creation. Then Adam will reach that highest intimacy with God, which when achieved will embed the image and likeness of God to the entirety of Adam's personality and character (Genesis 1:26). This great success would be achieved by Man without the sufferings, pain, and death. So it is no wonder that the first command in the Garden is the positive command to eat from the Tree of Life. If Adam obey first this 1st positive commandment, then he will be totally and completely at one with God, and God will be at one with Adam; both knowing Good and Evil in the Godly way (Genesis 3:22). And Adam & Eve would have acquired ETERNAL LIFE. The Evil aspect will be known by Adam & Eve via the teachings and revelations of God the Father, which means that Adam and his progeny will have the knowledge and control of Evil. This means that the Evil Forces will be under the control and dominion of Adam, instead of Adam submitting to Evil! At this highest level of Adam's Divinity, the evil is outside of him, and can not do any harm. In fact, the Evil Forces and the Serpent will be in subjection to Adam and his Children. Also, Adam will be able to procreate children in the side of the Holy Spirit, and not from the aspect of the Evil Inclination. Then Man is now qualified and ready to be the partner of God the Father in the continuing operation, maintenance, and management of the several universes that are now existing, and the creation of myriad of worlds that the Father is still contemplating. This is the purpose and the intended process of the full and complete creation of man, without the pain, sufferings, sorrows, destruction, and death. This is similar to Christ's admonition in (Matthew 6:33). But, since Adam disobeyed God by eating from the prohibited Tree of Knowledge of Good and Evil, Adam acquired the Knowledge of Good and Evil via SIN or Disobedience, and against the WILL OF GOD. Adam, then, was disqualified to eat from the TREE OF LIFE, which has the WILL OF GOD THE FATHER (Genesis 3:22). Since man disobeyed God by eating the forbidden fruit of the Tree of Knowledge of Good and Evil, man is now prohibited to eat from the Tree of Life, which was not prohibited before. Things were now reversed and inverted, because man did not follow the proper sequence of obedience to God's commandments. I would like to inject here a very important concept that everyone must be aware of. This is about the existence of both the positive and negative Commandments of God. We must know how to properly deal with both of them. For example, Genesis 2:16 is a positive commandment to eat from the Trees in the Garden, which include primarily the TREE OF LIFE. 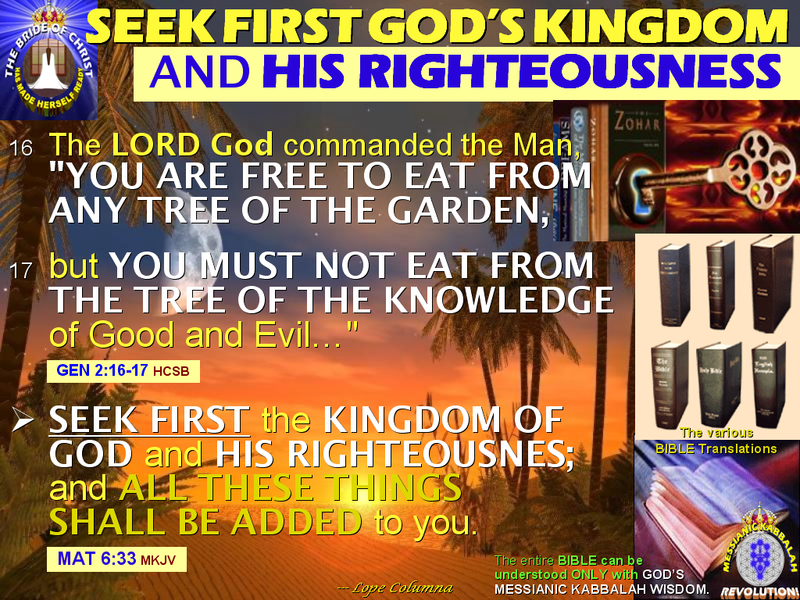 But the very next verse, Genesis 2:17 is a negative commandment NOT to eat from the Tree of Knowledge of Good and Evil! Thus, the two (positive and negative) commandments must be taken together in the proper sequence to properly obey God. For Man to regain the right to eat from the Tree of Life, he must completely purify himself of sins. So, Man has to undergo the various processes of sin purification: pain, hard labor, exile, diseases, sufferings, sorrows, poverty, deception, destruction, and finally death. And for whatever lack, shortcomings, or inability of a man or woman to purify themselves of the impurities of Sin, the sufferings and death sacrifice of Christ are available to fill up. This requires the genuine spirit of Repentance and Faith on the Lord Jesus Christ. And in the End-Time Generation, God has provided a relatively painless way of Sin Purification -- the purifying Messianic Kabbalah Wisdom. 1. Via Tribulations, Sufferings, Disasters, Wars, Terrorism, etc. 2. Via The Purifying True Gospel of God's Messianic Kabbalah Wisdom! According to Messianic Kabbalah, the purification process for a spiritually stained soul is either a person's own sincere repentance, or the Divinely ordained punishment that comes in its place. Continued on Part 4: Did You Know That You Can Obey God's Commandments, Yet, Still Guilty of Disobedience? Know the Proper Sequence of Obeying God! Simone Kroeker, Mary-Antonette Peredo Banaga and 5 others like this. Mary-Antonette Peredo Banaga Amen, Praise The Lord! Maamearaba Aikins Please God help us to choose what is best for us. Adam Houseman That is not at all what would have happened if Adam and Eve had eaten first from the tree of life, than the tree of knowledge, they would have been in the same predicament as Satan himself. (Edit) I think I read something similar from EGW. With some of my study of the fall, I have concluded similarly with her.